Confession: this picture was taken on Saturday, but I had a cup of the same tea this morning. I don’t want the blog world to believe that I whip up fluffy pancakes and sausage on an ordinary Tuesday morning. That’s not happenin’ here. Nope. Anyway, this is carrot cake loose leaf tea in one of my favorite mugs. The tea is delicious. It’s from the Oswego Tea Company. It’s nicely spicy and a little sweet even without a sweetener. There are pieces of dried carrots and spices mixed with black tea. It tastes and smells like autumn. Love it! The mug was a gift from my mom and dad. I believe it was for my birthday when I was first married and living far away. On the other side it says, “In all the ways that really count, I can always count on you.” I love it. I’ve been using it almost everyday lately. I love the picture, and the message, and the fact that my mom picked it out for me. Finally, I must share my dear tea man with you. Isn’t he the cutest thing? He is a diffuser for loose leaf tea, and I love how content he looks relaxing in the hot water. I can’t help but laugh! Officially called “Mister Tea,” my tea man was my Mother’s Day gift this year. I first encountered him in this video, and I fell in love! (He is shown in the first couple of minutes of the video.) You can also buy your own little fellow on Amazon. Please tell me in the comments what kind of tea you are enjoying. That is cute. I never saw a little tea man before. He makes my morning tea more fun! I am drinking English breakfast tea with lots of milk and sugar (or “baby tea” as my Yorkshire room-mate at college used to call it!). 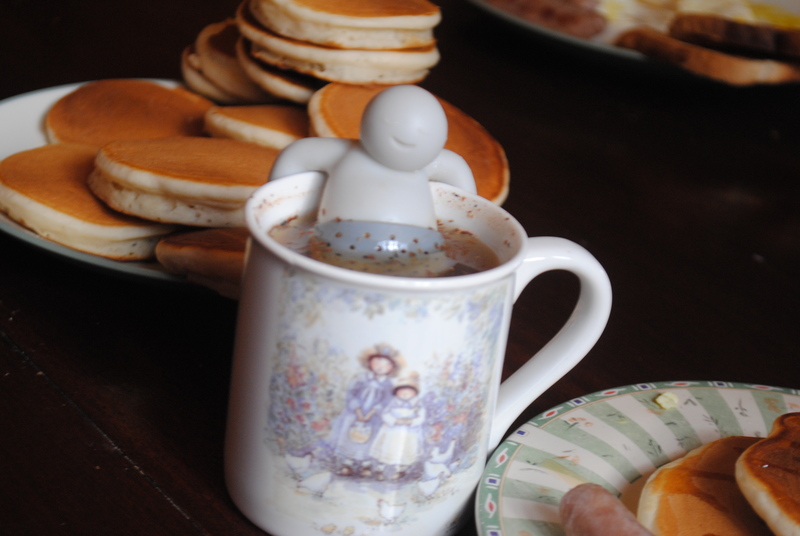 I love your little tea man – some cold mornings I feel like climbing into my cup of tea too! Oh, baby tea! I like that. I drink “regular” teas (like English breakfast, orange pekoe, and Earl Grey) with milk and sugar. I usually drink flavored teas with sugar, honey, or nothing at all. And yes, I would like to jump in my cup, too. Isn’t he cute?! Mmm…ginger lemon. I love this picture. I had carrot cake tea today! In a great big “Summer Breeze” mug.